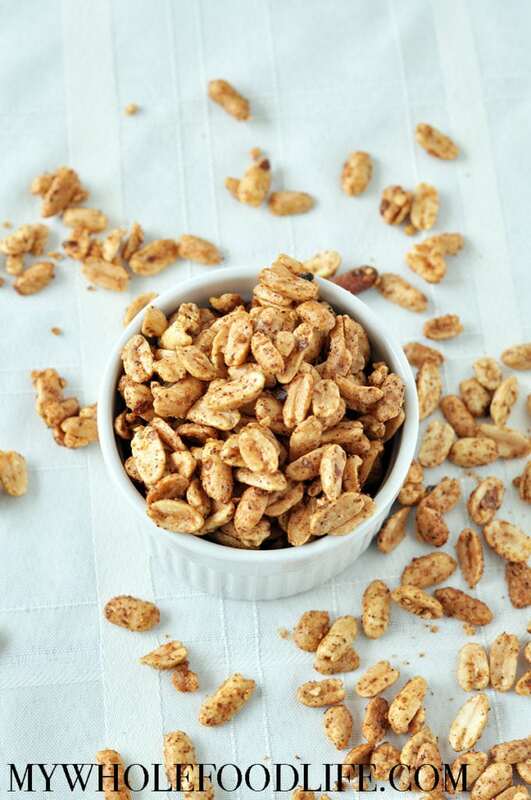 These Sweet and Spicy Roasted Peanuts will become your new favorite snack. Perfect for game day snacking too. They pack big flavors with hints of sweetness and an extra kick of spices. Just like my maple glazed pecans, this recipe is going to be hard to stop eating! If you have an allergy to peanuts, I do think any other nut should work as well. Sunflower seeds or pumpkin seeds might also work for a nut-free option. You can make these up in about 10 minutes. Super easy snacking! I also think roasted chickpeas may be delicious with this seasoning. I think I will try those next. In the meantime, I hope you enjoy these roasted peanuts as much as we did! In a bowl , add all the ingredients and mix well. Spread peanuts onto a lined baking sheet . Bake for 10-12 minutes, stopping halfway through to shake the nuts around. Store these nuts in an airtight container. They should keep for several weeks. Enjoy! Do they dry out, or are they sticky? They are not sticky at all. This is so easy , spicy and tasty recipe. I will be try this. Can I store this roasted peanuts? Thanks. Thanks! Yes you can store them in an airtight container in the pantry. Thanks Melissa for your valuable feedback.